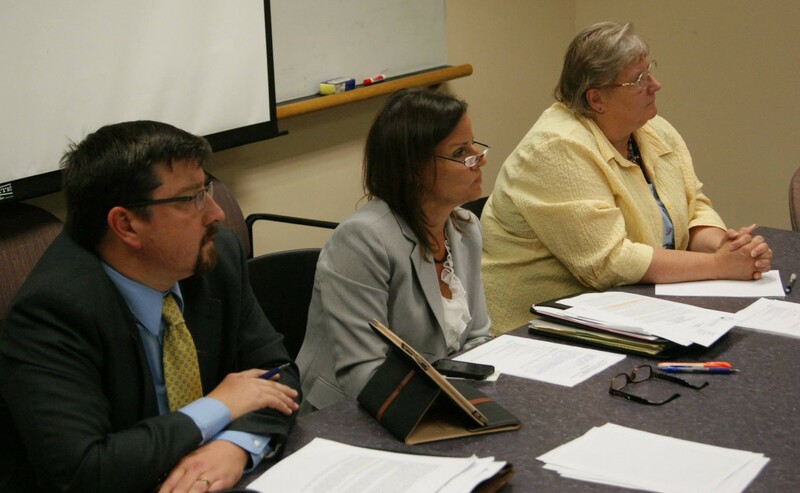 Thank you for giving me the opportunity to share my thoughts about the proposed “emergency” revisions to Ch. Adm. 2. My name is Linda Roberson. I’ve lived my entire adult life in Wisconsin. I went to law school here and have practiced law here since 1974 – almost 40 years. As a lawyer, I’ve drafted statutes for the Legislative Reference Bureau, advised the Legislature on policy issues as a participant in State Bar advisory committees, and litigated issues of statutory interpretation before all levels of the Wisconsin Court system. I have an abiding respect for the rule of law. I treasure our State Constitution and the rights it secures for all Wisconsin citizens. I understand the process that must be undertaken for fair statutory revisions and fair rule-making, in order to insure that the rules that bind all of us in an orderly society are made in a thoughtful and deliberative manner. I respect that process. I write today because the proposed rule changes were promulgated in violation of that process, and more importantly, violate the Wisconsin Constitution and the rights it confers on our state’s citizens. The rule is procedurally and substantively unsound. It should not be implemented. I contacted Gwendolyn Coomer and Betsy Winterhack nearly a month ago because of my concern that the required procedure had not been followed and accordingly the opportunity for thoughtful and deliberative consideration of the proposed Adm. 2 would be negatively affected. I have not received a response to my concerns. I take the silence on the part of the Agency as an admission that the process was not followed. Thus, the proposed rule is invalid because of the failure to follow appropriate procedure and must be held in abeyance unless and until the DOA complies with the relevant statutes and order. It should be a given that a rule-making authority should follow its own rules in making new rules. On a substantive basis, the permit requirement included in the rule creates an undue burden on citizens who wish to exercise their Constitutionally protected rights to freedom of speech and peaceful assembly. This requirement is obviously designed to target the daily Sing Along that spontaneously occurs at noon on most week days. 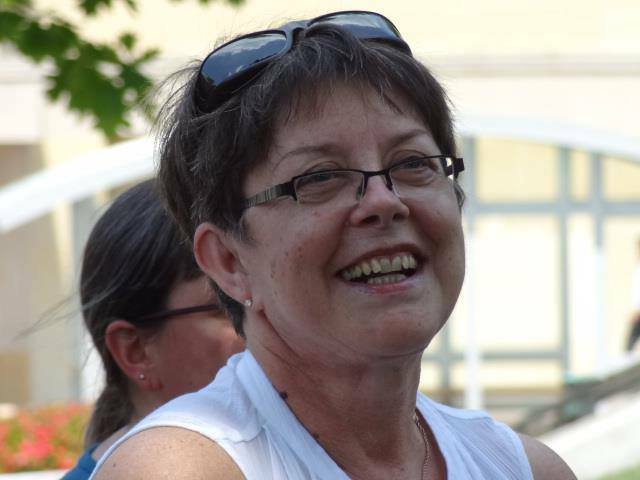 It assumes that there is an entity under whose aegis the Sing Along in the rotunda occurs, and that this entity is responsible for participants, authorized to apply for a permit to enable individuals to speak and sing in the rotunda, and entitled to exclude individuals who choose not to follow the access policies set forth in ch. Adm. 2. In fact, there is no such entity, and there is no one who has authority to monitor behavior of other persons who might happen to be in the rotunda over the noon hour. Rather, there is an informal understanding that, as has been the case for the past 700-plus work days, people wishing to address their grievances with peaceful song will likely find others in or near the capitol who wish to do the same. There is no person or entity who wishes to “hold” an event that would require a permit. Issuing citations to individuals who come to the capitol, in the absence of the existence of any person or entity with authority to request a permit, impermissibly burdens the rights of free speech and assembly. Requiring an individual who wishes to speak freely and/or assemble to take responsibility for everyone else who might be there by obtaining a permit and becoming responsible for the actions of these unknown others also impermissibly burdens the freedoms of speech and assembly. Potentially requiring such an individual to bear the expense of the overreaching presence of multiple Capitol Police officers is a further impermissible burden. The requirement of a permit for a “rally” consisting of four or more persons clearly violates the Wisconsin Constitution, as has been explained in this week’s decision by Chief Judge Conley. The Constitution protects the right of citizens to assemble and speak in public places; the capitol rotunda is such a public place. Since Judge Conley’s ruling invalidate the four or more” nonsense, the rule now does not address the number of people who may constitutionally assemble there without the requirement that a group or individual accept responsibility for the assemblage and apply for a permit. A small group of people peacefully singing folk songs during non-working hours in the rotunda cannot reasonably be denied the right to continue to do so without running afoul of Constitutional protections. The DOA’s response to Judge Conley’s decision requires amendment of Ch. Adm. 2 which should be accomplished only after appropriate input is solicited and obtained and after those affected have the opportunity to be heard. How is it to be determined whether an individual’s expectation of the size of the group is reasonable? What effort will be made to inform assembled individuals that their assembly is deemed unlawful prior to the issuing of citations? What does it mean to “participate” in an “event?” What happens to me if I appear as “participant” number 17 and subsequently four more people show up? These and many other questions must be thoughtfully and responsibly addressed prior to the implementation of any rule. Today, the language of the rule is so vague as to deny notice to persons in the Capitol building as to whether their presence is objectionable to the DOA – and that assumes that the DOA has the right to object in the first place. This brings me to my last point: the rule as promulgated does not give proper deference to First Amendment rights as compared to other “events” for which people might wish to reserve the rotunda. Weddings and private events can constitute a proper use of public spaces, but not at the expense of the function the space is designed to serve. Even a worthy event such as the Red Cross Blood Drive is a permissive use of space in the Capitol building. The DOA has authority to promulgate rules with respect to permissive uses of the building, though the attempt to do so with this “emergency” rule is certainly flawed. 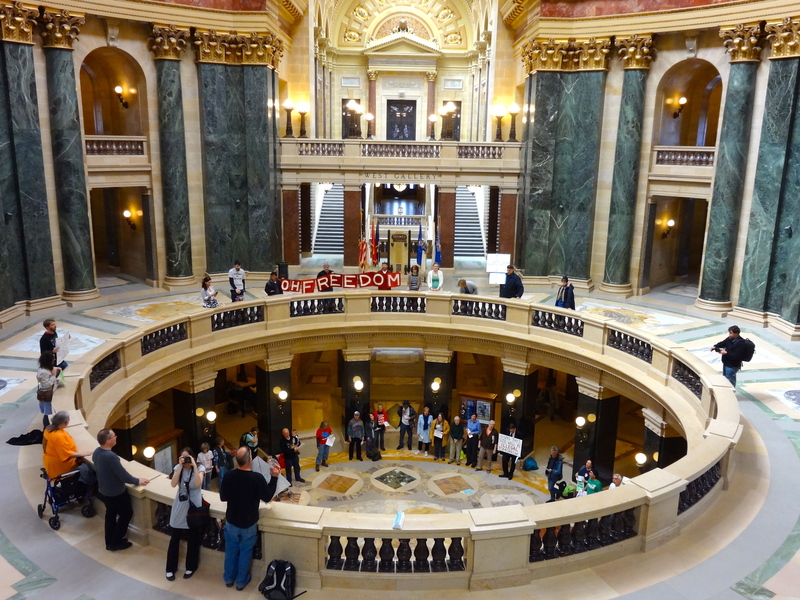 On the other hand, the use of the rotunda for the exercise of the rights to speak freely, to assemble, and to petition our government for the redress of grievances has primacy over all other uses of the space, pursuant to the Wisconsin Constitution. The “emergency” rule changes fail to acknowledge that the exercise of Constitutional rights stands before all other uses of the Capitol building. This major conceptual flaw in the drafting of the rule virtually guarantees that it cannot withstand court scrutiny and thus this entire exercise of invalid promulgation of a fatally flawed rule is a colossal waste of taxpayer time and money. The bottom line: there is no emergency. Nothing is happening today that hasn’t happened daily for the past many, many months. The haste with which this “emergency” rule was crafted has resulted in sloppy and unenforceable drafting and impermissible restriction on Constitutionally protected rights. 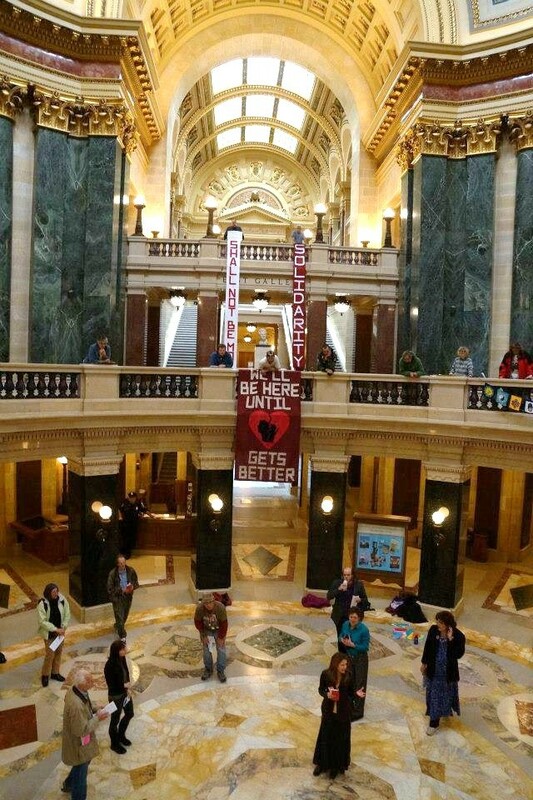 It is clear that the daily presence of the Solidarity Sing Along in the rotunda has hit a nerve with the present administration; the DOA oversteps its authority by declaring a bogus “emergency” in a flawed attempt to spare Scott Walker from hearing from the people who oppose the multitude of travesties he is inflicting on our state. It is Scott Walker’s duty and solemn obligation to listen to his constituents. His minions must take a deep breath, go back to the drawing board, read about the history of our magnificent Capitol building, review the Constitution, and start over to draft a rule that respects the rights of the governed.